Barbeque pork is used in many Chinese recipes from soups, appetizers, stir fried rice and noodle to on their own with a bowl of rice. 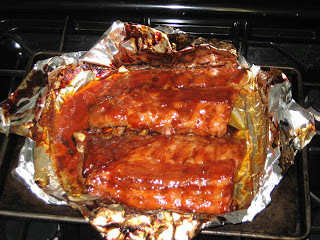 I used same marinade for my pork back ribs. After 3 hours of slow roasting in sealed aluminum bag at 290 °F and hit of open broil at 400 °F for 30 minutes they came out nice a sticky, fall-off-the-bone done. What a treat! Maybe I should file it under Dessert, really. Put all ingredients in small sauce pan and simmer, covered, for 10 – 15 minutes stirring frequently. Strain through strainer to remove any solids and save in a jar. Remove membrane covering the rib side of rack. Take a piece of heavy aluminum sheet that will generously cover the ribs in a sort of sealed bag. 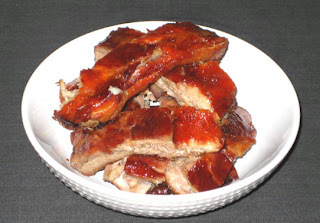 Place ribs meat side down at one end of foil and brush with Char Siu sauce. 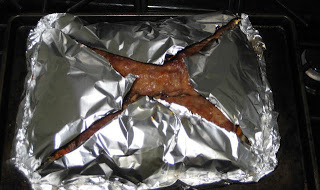 Turn over rib side down (be careful not to pierce the foil!!!) and rub meat generously with the sauce. Fold over the foil and seal sides by folding over the foil several times. Through the remaining open side pour in about 1/3 cup rice wine, fold the foil over several times to make airtight bag and place on baking sheet. Place in middle of preheated oven and bake for 30 minutes. Lower the temperature to 290 °F without opening oven door and cook for 2 hours. 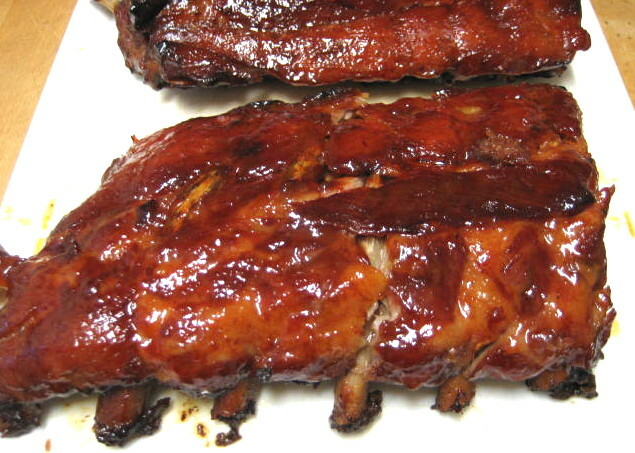 After 2-1/2 hours in the oven raise the temperature to 375°F and remove the ribs. 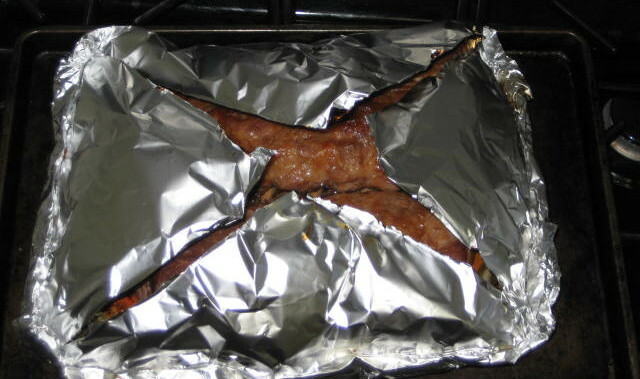 Cut “X” in the aluminum bag being careful about steam that will inevitably escape. 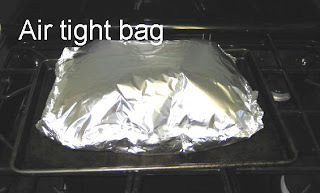 Roll or bend foil to open the bag, brush with more sauce and return to oven for another 30 minutes or till golden brown. When golden brown, remove and cut into individual rib sections. Serve with rice but we always eat ribs with rye bread. Don’t ask, just try it, you will like it. Excellent combo, just like a rye bread, chocolate and beer. Best dessert ever J ! 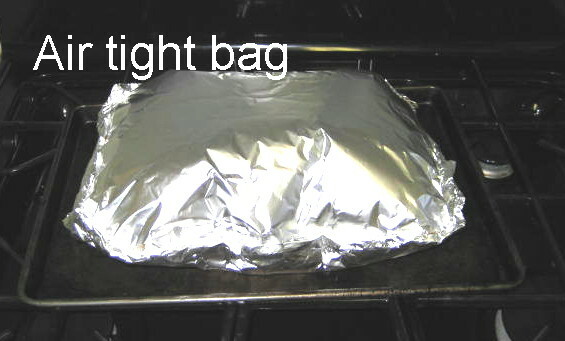 Fold over the foil, brush with more sauce and return to 375°F oven for another 30 minutes. Ready to be cut and plated.